Our Ugadi festive meal was simple and not elaborate. I prepared mamidikaya pulihora, carrot kothimira pachadi, mokka jonna garelu (corn vadas), pesarappu payasam, white rice, rasam, vadiyalu, fried dried green chillis and curd. On Ugadi we celebrate the season’s fresh produce of mangoes by preparing Mamidikaya Annam (green mango rice), a South Indian rice delicacy, prepared on the same lines as lemon rice (nimmakaya annam) and is the most simple and easiest recipe one can ever make. A healthy rice dish unlike most pulaos and biryanis which call for a generous amount of oil or ghee. The key to this rice dish is mango which lends it a tangy flavor and is counter balanced with a fragrant tempering of dals, chillis, curry leaves and a good measure of peanuts. Heat oil in a heavy bottomed vessel and add the mustard seeds. Once they pop, add the channa dal and gram dal and let them turn red on medium heat. Now add the red chillis, green chillis, grated ginger, curry leaves, ginger, turmeric pwd and asafoetida. Toss them for a few seconds. Add the grated mango and stir fry it for a few mts (approx 3-4 mts). Add the roasted peanuts and cashewnuts, turn off heat and keep aside. Spread the cooked white rice on a wide plate, sprinkle salt and add the tempering and use your hand to combine well till the tempering is well blended with the rice. Adjust salt. Serve hot with vadiyalu, perugu or pachadi of your choice. ah sailu… mouth watering thali. nothing can beat traditional food served in banana leaf. hope u will post the recipe for carrot kothimira pachadi, mokka jonna garelu. they look so delicious. i will look forward to it. Yes, Sups, I will be posting the pachadi and garelu recipes. Wow! !… Simple recipe. A perfect recipe for bachelors like me. :-). Trying it right away.. Thanks. And belated Ugaadi Subhakankshalu..
Now that’s a feast.I make mango pulihora slightly different way by using a powder of dania,roasted peanuts and red chillies.Yours is very simple.Will sure try this. Waw looks so delicious….shailu looking farward for carrot kothimira pachadi and corn vadalu…. you call that ‘not elaborate’? that’s how much we cook in a week. Hi Sailu, Your dishes reminded me of my MIL. Now waiting for your recipe on mokka jonna garelu, payasam and pachadi. I always miss India when I think of festivals. Nice lovely spread of delicious food. URs festive plate is tempting everyone sailu…. 🙂 I am smiling at swapna’s comment above! You call this simple! Hello lady … I am so hungry! The garelu and pachadi look yummy! And of course mamidi pulihora is my all time favorite! Hope u guys had a wonderful ugadi! 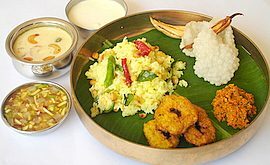 Ugadi Subakhankshalu. Isn’t that an elaborate lunch? Looks yummy. I love mango pulihora and I can make it whenever I can get my hands on nice raw mangoes. That is one festive meal. Love mango puliharam, like shri said i make it whenever i get hold of a nice raw mango in the Indian store. Looking forward for the recipe of carrot kothimera pachadi. sailu, you have a hungry blog that eats up comments. Happy Ugadi! though a little late. The thali looks fantastic. Great food and great presentation. Mamidikaya pulihora-mouthwatering 🙂 and i am loking forward to the corn-vadai recipe. Spread looks delicious!!! I like this version of mango rice. Thanks for sharing. Thats a very tempting and amazing spread Sailu. Wish I could eat some from that. Its too good. are u working on ur website sailu? i have been trying to check ur blog since last 3 days. at last i made it. the link was not working till now. hey nice to see u’r blog up and running. I was so restless these couple of days as i couldn’t access u’r wonderful recipes!!! u are back with a bang!!! Other than the server prob you were having, I encounter one more prob which I don’t know if happens with everyone. It takes a lot of time for this site to load compared to a “Blogspot” site. Did you notice that Sailaja ? Yes, I’m aware of it, Sandeepa and am working on it. What an appetizing plate. I love it. Thanks for the heavenly treat. I have been reading your blog for a while now and am always excited to try your recipies.They are always wonderful and I enjoy making them.Thanks for these wonderful treats. I was wondering how mango rice is made! One of my chittis used to make it a lot – is it an Andhra speciality? I ask because my chitti has spent all her time in Secunderabad! The season is just right for this recipe! Thanks! Guess I am late to wish you ‘Happy Ugadi’ Sailaja, but never late to drroooll over ur thali.. *mango pulihora* is the best.. love the color..
Ugadi Wishes n advance to you n your family! reminded of my grandma back home n festive fun in india! can you please post the recipe for the ‘corn garelu’…? Goodmorning.This is sarvani from CANADA.I have seen yr copyrights saying u r from Gudivada.I hail from Gudivada .Now in Canada. cud u please tell me yr family name n whereabout’s in gudivada? I used to live near Rajadarbar hotel in S.N. puram, GDV. Carrot Kothimira pachadi gurinchi rasaru kada adi ela cheyali? Swati garu, I have blogged Carrot Kothimira Pacchadi. Capsicum masala rice meeku nachinanduku chala santhosham. what a superb spread….love the colours and that mango pulihara is next on my list to be attacked….with raw mangoes in the market…how can i resist!! belated Ugadi subhakankshalu…. i went through all your rice verieties. i found you missing vaamu annam which is one of my husband’s favourites.as you are in vizag you can get this reciepe. hope u will blog my request. I love ur recipes and try them all. U Rock!!!! can pls post the recipe for carrot kothimira pachadi. Yesterday had a chance to make it really came out very good….have tried out couple of other rcps also…..!….but this was the beat I could get close to what you have described….! Thanks for such nice recipies… keep in touch. tried this recipe..came out yummy..